Renee wanted me to let you all know that she’s going to be posting her pages of The Only Thing I’m Really Afraid of is the Thought of Dying Here Alone and Forgotten on Fridays sometime during the day, since it lines up nicely with her current work schedule. So expect Alpha Flag updates then instead of Thursdays until her short finishes! Alpha Flag Issues for Sale in San Diego Stores! A great store with a second location down the street specializing in games. Also, a really cute store rat! A bigger, warehouse-style store that’d be your best bet to find a bunch of decades-old back issues for cheap. It’s a bit hard to find. Kind of tucked away at the end of a business park. A store packed with goods, run by a fellow comics creator. Looks like I ticked the wrong box in Storenvy and it made it so there were very limited numbers of Issue 03 available for preorder. I’ve fixed that, and it’s back up in the store right here. You can still use the FOXTROT coupon code for 20% discounts, and I spoke with the printer–looks like the issues will be in my hands during the first week of October. Once the books arrive, the coupon expires! So if you’re looking for a discount make sure you order before then! …and it’s both colored and drawn by Renee! Still written by me, though. It’s a little different than the main Alpha Flag story in tone and content, being more of a fairytale, but I have confidence that you guys will totally dig it. I’m really excited that Renee asked to draw a story I wrote as her return to drawing comics after her hiatus because, as you will see over the coming weeks, she’s really great at comics. Alone and Forgotten begins today with the lovely cover as seen above and will continue weekly. Alpha Flag issue 3 will include the Echo and Foxtrot chapters, and you’ll definitely be able to read what Kilo whispered to the diver while standing on his shoulder! Untitled SF 3 will be a double-length issue, clocking in at 23 pages that’ll see the return of Koharu from the first chapter. If you haven’t read those yet, you can do that here. I’ve also added some mixed media drawings that Renee and I did together to the store, just in case you wanted one of those and haven’t had the fortune (or don’t live on the West Coast of the US!) to see us at a convention. There are a few of each character available. 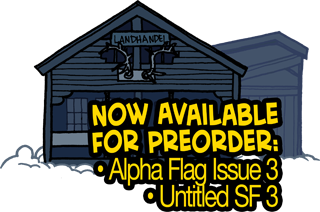 Also, also, I just spent the last couple of days getting a digital store together so you can download PDF and/or CBZ versions of all of Alpha Flag (well, save for Foxtrot. That’ll be up as soon as Renee hands me the finished colors–so, soon!) and SF. All for Free+. Basically, pay what you want. If you want free, free is fine! Phew, I think that’s everything. We have some more exciting stuff lined up in the coming weeks, too, so be ready for that, too!